The 35 ORIGINAL PRELUDES for guitar by F. Tárrega are perhaps the highest-quality part of his body of music. They remind us of the Preludes by F. Chopin, whom Tárrega greatly admired, and of which he made various transcriptions for the guitar. This musical formula was used during the Romantic period in two ways: as a simple warm-up exercise before the public at a recital, and as a discourse of the highest musical level that was played at important concerts. Tárrega composed a few for the first use; the majority were written to be included, due to their quality, at public recitals. 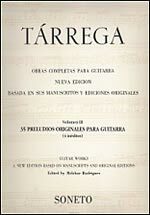 This edition is beautifully presented and represents all of Tarrega including a good set of his transcriptions. A real treasure trove of works from the simple to the complex. Must have for any guitarist.